Artificial grass aftercare to make the neighbours green with envy! Comprehensive and cost effective maintenance packages for artificial grass aftercare are available from Harbron Home Improvements. Such is the quality of the company’s award winning product range that very little upkeep is required. But increasing numbers of customers are trusting in Harbron’s team of experts to keep their new artificial grass looking its very best - all year round! It’s why Habron Home Improvements has established itself as the South West’s leading artificial grass installers and outdoor transformation specialists. Harbron’s artificial grass maintenance packages build on the company’s commitment to offering great value for money, as well as peace of mind. Every aspect of maintenance is covered in the aftercare packages, which are delivered by a highly experienced and knowledgeable team. Harbron recommend an annual visit to keep your grass looking its very best…and making your neighbours green with envy! First the team clear water and vegetation from your grassed area, disposing of it before carrying out a full and detailed inspection. This is to check for any signs of wear and tear or possible wildlife damage. After the inspection, the grass gets a deep clean using weed or moss killer if required before the area gets a thorough spray finish. Finally the team carry out a ‘brush and blow’ designed to get the ‘grass’ pile into peak condition. 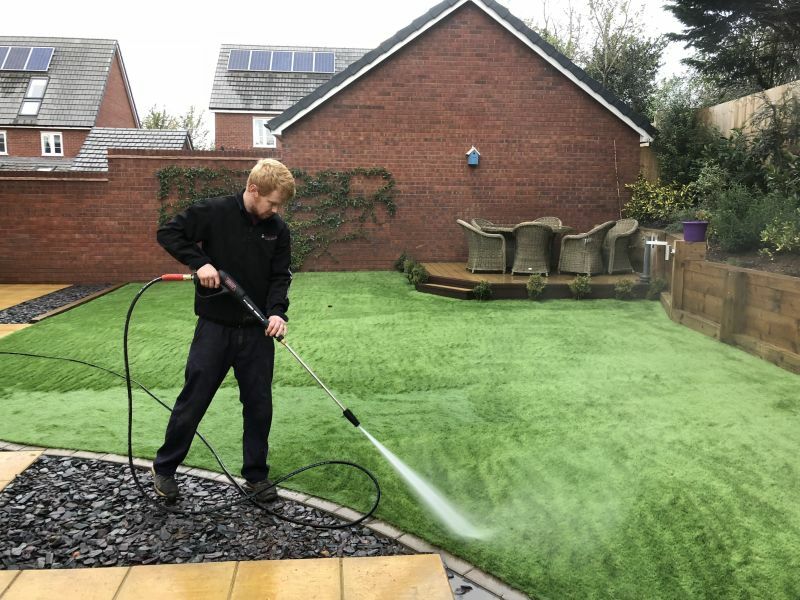 Remember, an annual maintenance visit is all you should need, but if you are having a special event we can give your grass a quick makeover to ensure it’s looking its absolute best! Don’t forget that Harbron Home Improvements also guarantees both its artificial grass products and labour for 10 years.